The Stella Duffy-directed Murder, Marple and Me ended its short tour with four nights at London’ Ambassadors Theatre, appropriately next door to the St. Martins Theatre that’s been showing The Mousetrap, the play based on the Agatha Christie novel that’s gone on to be the longest running stage production ever, since 1974. The Mousetrap would have already been going nine years when Margaret Rutherford brought Christie’s silver-haired spinster to the big screen. Not that Rutherford would have seen it. When the comedy actress reluctantly agreed to play Miss Marple at the age of 70 she’d never read – or intended to read – any of Christie’s books. She was also, mysteriously uneasy about the idea playing a woman who relished a good murder. And the indifference was mutual. Christie was less than impressed at the idea of her beloved ‘birdlike’ OAP sleuth being played by a comedy actress whose fondness for treats from Fortnum and Mason left her with a waistline more ostrich than robin. But despite their lack of interest in each other’s professional lives, the pair formed a friendship of sorts during shooting of the first Rutherford Marple, Murder, She Said (I assume, I don’t remember it being referenced during the performance) in 1961. Murder, Marple and Me is a fictionalised account of what might have brought the two women together based on real life events. 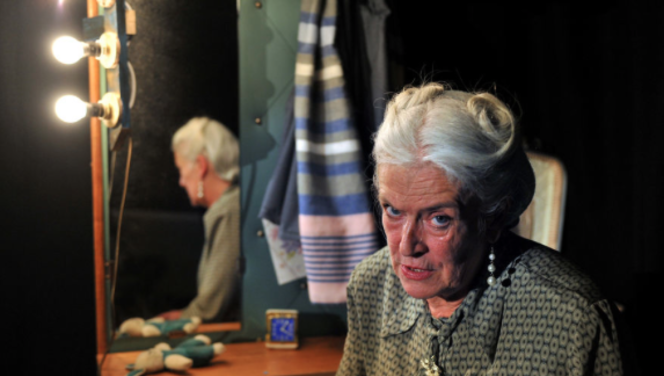 Murder, Marple and Me is a one-woman show with Janet Prince at the helm, breaking down the fourth wall as Agatha Christie, Margaret Rutherford and Miss Marple. Miss M, as ever, sits observing from the sidelines, the click of knitting needles soundtracking her telling of the more grisly details of the story that eventually unravels. Prince plays Rutherford with a jolly hockey sticks joviality, physically embodying her less gym teacher like briskness brilliantly; legs wide apart, back slightly hunched. Prince’s Christie meanwhile has a warmth I’ve never associated with the Queen of Crime, but which suits her. Not that she’s a sweet old lady, the steeliness that made her the world’s best selling author is never far away. Her Miss Marple meanwhile was probably the closest to what Christie had in mind, her “my dears” concealing a sharpness of mind and genuine enjoyment of murder. In many ways there’s a fourth character; ‘Peggy’, Margaret’s guileless, childlike persona that counts cuddly toys as “her family” whose odd regressive behaviour alerts the sharp-eyed Christie to Rutherford’s secret – no one, Agatha surmises, could slip so naturally into such an innocent state if they weren’t in hiding from something. That, and her belief that no-one would turn down the opportunity to play her beloved Miss Marple without a very, very good reason. Sensing a mystery, Christie extracts the dark secret that made the actress queasy at the idea of playing a woman who lives for murder over high tea in Rutherford’s parlour. As is so often the case, Murder, Marple and Me is a play of two halves. And, like Christie’s novels, where her world of bone china tea cups and dollies hides sinister secrets, Murder, Marple and Me is, as Miss M says, “bittersweet”. Philip Meeks’s script in the first half is littered with great one liners, while Prince’s physical performance, particularly as Margaret, is often brilliant comic turn. The second half is darker, I actually winced during Miss Marple’s exuberant re-enactment of one of the key scene. Not that the end is gloomy, Margaret is upbeat, despite losing her Oscar and Miss Marple and Agatha have got their murder. And we, the audience, have got a charming hour of great theatre about three fascinating women. This entry was tagged Agatha Christie, janet prince, Marple and me, Miss Marple, murder, philip meeks, stella duffy, Theatre, theatre review. Bookmark the permalink.